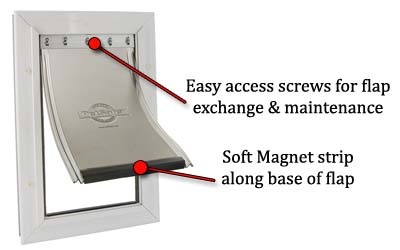 The Freedom Pet Door is manufactured by PetSafe. It has an aluminum frame, flexible vinyl flap and plastic locking cover. This door is available in door mounted version only; fitting 3/8" to 2" thickness doors. Note: The Freedom door is considered a utility door. The aluminum frame is a thin gauge and has crimped corners to form frame. The flap is replaceable and uses the PetSafe PAC11 Series replacement flaps. 10 7/8" x 15 3/4"
12 7/8" x 19 3/4"
16 3/8" x 27 1/4"